17-3/4"W x 2-3/4"D x 14"H. Accommodates most 17.3" notebooks. 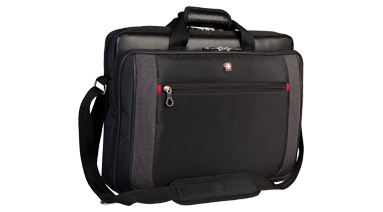 Features a 10" tablet pocket, front compartment organizer, document pocket and a back web strap to fit over an upright handle. Black. Microfibre with Polytex® trim. 1.5 lbs.